Home Blog Congrats to our Grand Prize Employee Donor winner Heather Thomas and second prize winner Ashley Payne! Heather Thomas, a case worker at Cox South Hospital has been donating since 2007 to support patients in need at CoxHealth. Today her generosity paid off when she won the grand prize of the Employee Donor Campaign. Heather will take home a 55 inch TV as a thank you for her incredible support over the years. 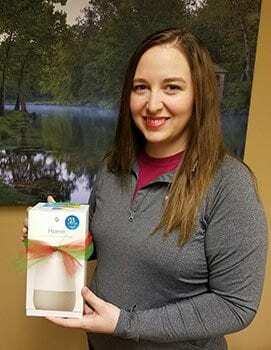 Ashley Payne will receive her prize this week also of a Google Home station and Google Gift Card. The CoxHealth Foundation and Children’s Miracle Network Hospitals gives each employee donor one entry into the drawing for each month they are a donor each year. All proceeds from the employee campaign are used to support patient care at CoxHealth for those things patients need, but cannot afford. “The impact is life changing for our patients, we are so grateful for the over 2,500 employee donors at CoxHealth,” says Lisa Alexander, president of the CoxHealth Foundation. “The giveaway is just a little way of saying THANK YOU to all our employees who go above and beyond in addition to all they do each day to deliver quality care.